Oh you know me and fruit. Sort of a rocky relationship. But I think I have found a new love. Pomegranate. Yes, I know – sort of ridiculous. Yeah, yeah- so I was bowled over by the mango incident. And I boasted about the fabulous little blueberry. But this time I’m really serious. I love pomegranate seeds. It wasn’t intentional. We first meet at a party. Lots of hor d’oeuvres – all of which I cannot remember except one. Brightly colored jewels perched on top of whatever-it-was in the filo cup (great recollection right?) Oh man, I was not prepared for what came next. These little jewels popped open releasing this sweet then tart juice followed by the crunch of the seed. It was like – magic. And so our relationship was born and I have never looked back. Those little jewels that won me over are actually the seeds of the pomegranate called arils. There can be hundreds of arils inside just one pomegranate. But getting those arils out can be kind of tricky and the juice of the pomegranate stains. So if you’re not careful you can literally have pomegranate juice everywhere (spoken from experience). You can purchase just the arils in grocery stores but it’s expensive. After many trial and error, I discovered an easy and fairly clean way to remove the seeds. Now pomegranate is a pretty common item in my grocery basket during their peak season, October through January. Lately, pomegranate juice has been pretty popular. That’s all fine and dandy, but just as with any other fruit, eating it in it’s whole form is much better than drinking the juice. Fruit juice loses all the fiber you get from eating the whole fruit. 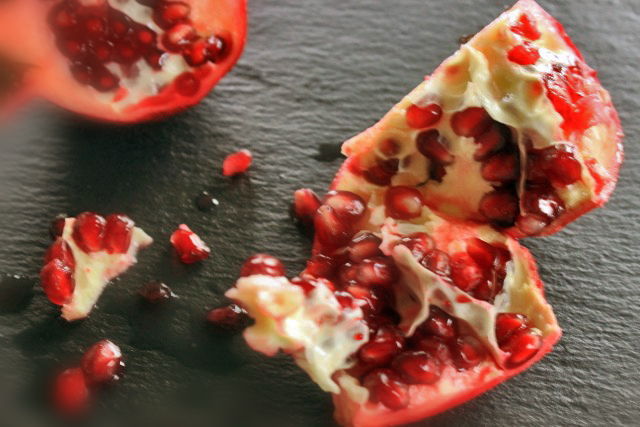 Pomegranates have recently been promoted as a “superfood” that can help many symptoms from various diseases. In reality, while it does have antiviral, antibacterial and antioxidant properties, there isn’t enough strong evidence that it can prevent or treat any health conditions. So what can you do with this brilliant little jewels? Just about anything! Sprinkle over salads or yogurt or add to any dish to make it pop with flavor. Pomegranate is actually a popular ingredient in Middle Eastern dishes (one of my favorite cuisines). I most commonly make a to-die-for Brussel sprouts salad. It’s a little creamy, a little crunchy, a little salty and a little tart. Perfect compliment to any meal! Cook bacon in olive oil until crispy. Set aside on paper towels. Add Brussels sprouts to same pan used to cook bacon. Cook for about 5 minutes until they get a bit crispy. Place Brussels sprouts, bacon, blue cheese, walnuts, pomegranate arils in a large bowl. Mix all ingredients for the dressing in a large bowl with a whisk or you can use a food processor. Season with salt and pepper. Toss salad ingredients and dressing together. I use a mandoline to shred the Brusssels sprouts. You can add more or less buttermilk depending on how thick you like your dressing.